These days, it’s hard to shake the feeling that everything is changing. Unfortunately, we cannot provide much more stability – because things are about change. This edition of SEO News for the month of October asks the question of whether the Internet as we know it will still exist in ten years, and explores what Google has planned for the next 20 years. Major birthdays are a welcome occasion to take stock and look ahead. It’s no different for companies and institutions. The search engine Google is currently celebrating its 20th anniversary. Consequently, the Head of Search, Ben Gomes, who was promoted just a few months ago, has attempted to construct a grand narrative in the form of a blog post. Gomes’ story begins with his childhood in India, when his only access to information was a public library, a remnant of Britain’s long-vanished colonial power, and finishes with the modern search engine. Gomes suggests that personalisation, automation and relevance are the cornerstones of a quality product that, according to him, still follows the original vision: “To organize the world’s information and make it universally accessible and useful”. But is this goal being sacrificed globally on the altar of proportionality? SEO news will take up this question again below, with regard to the double standards in dealing with China. An interesting issue for everyday SEO work, however, is a paradigm shift which Gomes believes will be groundbreaking for Google over the next 20 years. The Head of Search confirms the vision of an invisible and omnipresent information, solutions and convenience machine. According to Google, the transformation to this ubiquitous service is to be followed by three fundamental processes of change. First, it’s about even stronger personalisation. At this level, Google wants to try to evolve from a situation-dependent provider of answers, into a constant companion. According to Gomes, users’ recurring information deficits and ongoing research projects will be recognised, taken up and handled. This is to be achieved, above all, by a restructuring of the user experience on the Google results page. All sorts of personalised elements will be found here in the near future to help users make their journey through the infinite information universe more efficient. The user not only gets to know themself in this process, more importantly, the search engine gets to know the user – that goes without saying. But before any criticisms can arise, we move swiftly on to the second paradigm shift: The answer before the question. Google has set out to identify and prepare information relevant to the individual user, even before they have formulated a search query at all. The key element here is technological. Following “Artificial Intelligence” and “Deep Learning”, a technique called “Neural Matching” should be especially helpful: It links the representation expressed by text, language or image with the higher-level object or concept. This represents the continuation of the concept of semantic searches and entities with new technological concepts, and is exceptionally consistent from a business perspective. The third pillar of the change should be a greater openness to visual information in the search systems. The visual search has great potential for users and advertisers, as we have already discussed several times before. Google is immediately taking action, introducing a complete overhaul of its image search, as well as the integration of its AI-driven image recognition technology “Lens” into the new generation of in-house “Pixel” smartphones. The interesting thing about Google’s anniversary publication is what it doesn’t mention: The voice assistant Google Home. This is a good sign that, despite all market constraints, Google is not distancing itself from its technological DNA and allowing itself to be pushed into a competition with the voice market leader Amazon. Contrary to the publicised hype, voice software is yet to create a huge stir in the search world. Oh, how everything is connected: The individual, the world, technology and democracy. More and more aspects of our existence are digitised or transmitted via digital channels. In this process, it always comes back to bias. The well-known tech companies are acting as the pacesetters of this upheaval with their platforms. It may not be too long before Facebook, Amazon or Google establish themselves as the quasi-institutionalised cornerstones of our social and economic systems. Even today, the real creative power of these companies often exceeds the capabilities of existing state regulations. And search engines are at the centre of this development as a human-machine interface and mediation platform. The most relevant shopping search engine Amazon, for example, is changing not only our personal consumption habits but also the appearance of our cities and landscapes, with its radical change in the retail sector. The convenience for the consumer has resulted in empty shops in the inner cities and miles of faceless logistics loading bays in the provinces. Meanwhile, global populism has cleverly used social and informational search systems to accurately position and reinforce its messages. Facebook and Google have contributed at least partially to the sudden and massive political upheaval in one of the largest democracies in the world. Maintaining their self-image as pure technology companies, Google, Facebook and the like, however, have so far persistently refused to accept responsibility for the consequences of their actions. Apart from public repentance and the vague announcement that they are looking for “technical solutions”, they have shown little openness to adapting their strategies to the intrinsic systemic dangers. So the interesting question is: do global technology companies have to represent those values of freedom and democracy that have laid the foundation for their own rise and success in the US and Western Europe? Or can companies such as Google or Facebook be flexible depending on the market situation, and utilise their technological advantage in dubious cases in the context of censorship and repression? Currently, the state of this debate can be seen in Google’s project “Dragonfly”. Since Mountain View has refused to censor its product content, the global leader has been denied access to the world’s largest and fastest-growing market. When Google ceased all activities in China in 2010, the People’s Republic was forced to do without it, and managed pretty well. China has managed just fine without competition for its own flagships Baidu, Tencent and Alibaba. According to consistent media reports, Google has been working for several months to restart involvement in the Middle Kingdom, with the blessing of the government in Beijing. Under the working title “Dragonfly”, Google is reportedly planning to launch a Search app and a Maps app. Working closely with the Chinese authorities, and under state control and censorship, these apps are expected to pave the way for future, widespread activities for Mountain View in the People’s Republic. It just goes to show that Google is prepared to play the game, if the price is right. This approach can be seen as pragmatically and economically motivated. Particularly in light of the fact that the Chinese authorities recently granted Google’s competitor Facebook company approval, then withdrew it after only one day. Rampant discord in the West and cooperative subordination in Asia: former Google CEO Eric Schmidt outlined the consequences of this double standard a few days ago in San Francisco. Schmidt told US news channel CNBC that he expects the Internet to divide over the next decade. He predicts a split into a Chinese-dominated and a US-dominated Internet by 2028 at the latest. Apparently, Silicon Valley has already given up on the vision of a global and open network for the world. However, the consequences of this development will be felt by every individual. Until 2015, voice interfaces were perceived by most as a nice gimmick that was limited to smartphones and navigation systems. But with Amazon Echo, this technology entered the living rooms of many consumers around the world virtually overnight. Amazon is holding back its exact sales figures and has not released any other details yet, but according to news portal Business Insider in 2015 alone, 2.4 million Amazon Echos were sold worldwide, while in 2016, sales rose to 5.2 million. As a result, Apple also revamped the previously neglected Siri and, after six years of silence concerning its speech recognition programme, in June 2017 announced a very unique device: the HomePod. Other companies were subsequently forced to follow this trend, even if they were unsure how to handle it. Transcribing simply means transforming spoken text or even sign language into a written form. Corresponding software has been available since 1982 when Dragon System launched its software. Somewhat rudimentary, it was developed for the former DOS (x86) and was called DragonDictate. Continuous transcribing was not yet possible, however 15 years later the same company launched Dragon NaturallySpeaking 1.0. The software already understood natural language so well that it was mainly used for computer dictation. However, the former systems had to be heavily voice trained, or the vocabulary used had to be limited in order to improve the recognition accuracy. Therefore, there were already corresponding prefabricated language packs for lawyers or medical practitioners, for example, whose language is highly specialised. Once optimised, these early systems delivered amazingly good results. In addition, Dragon already offered the option to control a Windows system with voice commands. After the language has been transcribed, the text can then be further processed. When considering a technology that can work with a natural-sounding input text, and that is also capable of reacting coherently to it, one quickly thinks of chatbots. These are a subclass of autonomous programmes called bots that can carry out certain tasks on their own. Chatbots simulate conversation partners and often act according to topics. Although these have enjoyed increasing popularity in recent years, it should also be described as a renaissance; The first chatbot was born 52 years ago. Computer scientist Joseph Weizenbaum developed ‘ELIZA’, which successfully demonstrated the processing of natural language and today is considered the prototype of modern chatbots. The development of ELIZA showed that simple means are sufficient to achieve good results in the Turing artificial intelligence (AI) test, which concerns the subjective evaluation of a conversation. In spite of the bot’s simple mechanisms, test subjects have begun to build a personal bond and even write about private matters. Experiences with this first conversational Interface attracted a lot of attention and continuously improved chatbot technologies. For example, in 1981, BITNET (Because It’s There NETwork) was launched, a network that links US research and teaching institutions. One component of this network was Bitnet Relay, a chat client that later became the Internet Relay Chat (IRC). Over the years, students and nerds have developed countless, more or less simple, chatbots for these chat systems, including ICQ. Like ELIZA, they were based on the simple recognition of sentences and not on the evaluation of knowledge. In 2003, another important development was sparked, banking on a new class of chatbots, Smart Assistants such as Siri. CALO, the ‘Cognitive Assistant that Learns and Organizes’, was a development initiated by the Defense Advanced Research Projects Agency, involving many American universities. The system should help the user to interact with information more effectively and provide assistance by constantly improving their ability to interpret the wishes of the user correctly. The concept is based on digital knowledge representation. In this way, knowledge can be captured in a digital system and made usable. Semantic networks allow objects and their capabilities to be mapped in relation to other objects that enable the Smart Assistant to understand what a user wants to express with a given utterance. For example, if a customer wants to order a ‘dry wine’ through their Smart Assistant, then it needs to understand the connection between the terms ‘dry’ and ‘wine’, depending on the context. Only then does it understand that this term refers to a taste sensation and not the absence of fluid. The simple recognition and comparison of texts, also called matching, and the intelligent analysis by means of knowledge representation are two different technologies that have evolved independently of each other. With the help of the matching approach, most applications can be implemented with straightforward resources. For more complex queries, however, a Smart Assistant is much better. However, in turn, this technology is more involved in terms of development and implementation because it requires a broad knowledge base. Currently, the chatbots that one usually comes across are based on matching technology and can be trained with the help of machine learning (ML). With this method, the system is given as many text variants as possible to a certain statement, which it learns in order to then recognise other similar sentences in its subsequent application, without the need for any special knowledge. Today we can choose between two technologies that can be used in a conversational interface. Depending on the requirements, one must ask the question whether a system that compares what has been said with learned sentence structures is sufficient or is a system needed that understands the meaning of what has been said and reacts accordingly? I used to love them as a child. Books where I could determine how the plot unfolded. How the book ended depended on the decisions that I made. My childhood days are over and choose your own adventure stories have lost their popularity – or at least that’s what I thought! Recently, however, they have been cropping up again. And in digital form. And the best part is that these new story formats are not just for children. Below is a summary of which channels these formats are available on and why they might be of particular interest for digital communication and therefore for corporate digital marketing. 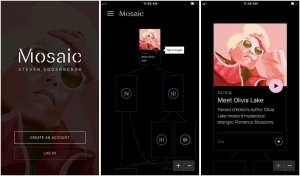 In the HBO series “Mosaic“, viewers can decide for themselves from which perspective they want to view the story from next. In the app linked to the show, users can put together the half-hour sequences on their own like a mosaic or a puzzle and in this way influence the chronological order of the narrative thread. If you listen to rumours from Bloomberg, Netflix is also planning interactive episodes for the fifth season of Black Mirror, where the audience will be able to determine the dystopian ending. It will certainly be interesting! 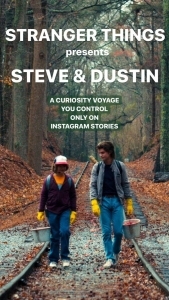 Fans of the Netflix series Stranger Things have the opportunity to control what Steve and Dustin, two of the main characters, talk about and do. 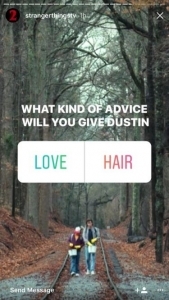 Poll stickers on Instagram stories will be used in a creative way to decide how the story unfolds. At the end of 2017, the BBC’s research and development department launched an interactive audio drama for voice assistants, such as Google Home and Amazon’s Alexa. The experience starts with the command “Alexa, open The Inspection Chamber”. What follows is a radio play that depends on the interaction with the listener. Sections of the 20-minute story change depending on the spoken responses from the user. There are three different endings in total. Why are these formats so interesting for digital marketing and communication? Choose your own adventure books drew me in so much when I was younger that I would read them several times over just to find out how the story would have changed if I had made a different decision at a certain point in the book. With exciting content, this high level of attention and commitment leads to long periods of time taken up with it. A creative way for brands and advertisers to draw in their customers and build loyalty. Hovering in front of me is a virtual shelf with various objects and categories for me to choose from. I use the controller to grab a small rocket, take it off the shelf and place it in the room. Thwack! The small spacecraft is rooted in front of me like something out of a comic book or video game. I walk around it and look at it from all sides. To my colleagues, I look a bit like Vin Diesel in Riddick. Not because of the muscles, unfortunately, but because of the futuristic glasses I am wearing. 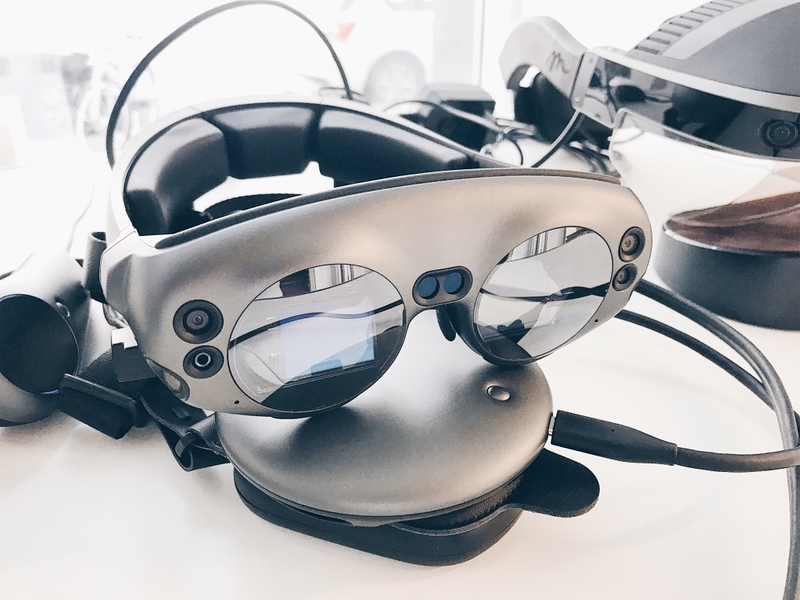 This is the headset of the new AR platform Magic Leap One. I had the opportunity to test the new system in the “Creator Edition” just a few days after its release in our Plan.Net Innovation Studio in Munich. The augmented image viewed through the glasses is slightly transparent, I can still see the pattern of the carpet behind the rocket – at least if I consciously try. The colours are bright and cheerful, as they should be – for a brief moment I have the desire to reach out a finger and poke the rocket. Immersion Level 1 is quickly achieved. Originally it was said that the glasses would be able to project images on six different levels in order to represent objects in different degrees of sharpness in connection with the tracking of the eye movement. Experts have already complained that the hardware only features two of these levels, which significantly reduces the effect of the experience. I cannot understand that, because, as I see it, the overall performance of the graphics still does not come close to being able to capitalise on these six levels. Everything still looks very video game-like and the resolution is not so high that this level of detail would play a crucial role in the sensory experience. The rocket is still stuck there. “Was that it?” I ask myself. I click on the rocket and it whizzes off with a “woosh!” No idea where it’s gone. Then I put a cowboy hat on one of my colleagues and give him a moustache from the objects library, which is still floating behind me in the room. At least until he leaves, and his hat and moustache are left hovering in space. Spoilsport. Then I grab a few things from the next category in the library, to quickly set up a kind of marble run. I can work on my design from all angles, while I talk to my colleagues and look them in the eye. It’s like I’m just wearing sunglasses, all the while working on a setup that has no regard for the laws of physics, but is otherwise quite realistic to me. Anyway, the whole thing quite quickly becomes pretty routine and natural. Then I grab the marble from the library and listen to it rumble through my tubing system, fall onto a trampoline, fly across the room and bounce off a real table leg in the room thanks to the real-world tracking. I look at my colleagues, beaming like a little kid and say: “That’s awesome, right?”. My three colleagues look at me, their hands in their pockets, and almost simultaneously shrug their shoulders. Immersion Level 2! Only I can see my marble track – I had forgotten that. This is one minor disadvantage – sharing the experiences is not quite so easy. The second app that I can test is about the Icelandic band Sigur Rós. They spent five years learning how to create or compose music in mixed reality, in collaboration with Magic Leap. Tónandi is the name of the app and it has exceptional gesture control – this app does not require a controller. The task is to move through different levels or worlds that come to life with gestures. For example, you can collect stones, prowl through virtual grass and prod virtual jellyfish. When you have more or less completed a scene, it creates a kind of wormhole, through which you plunge into the next scene. Impressive! The variety of the gestures you can perform using your own hand movements is a huge advantage. There are eight different gestures that the system recognises. Developers can design and add even more gestures. From my perspective, this is a huge advantage of the Magic Leap system. Microsoft currently only offers two defined gestures. 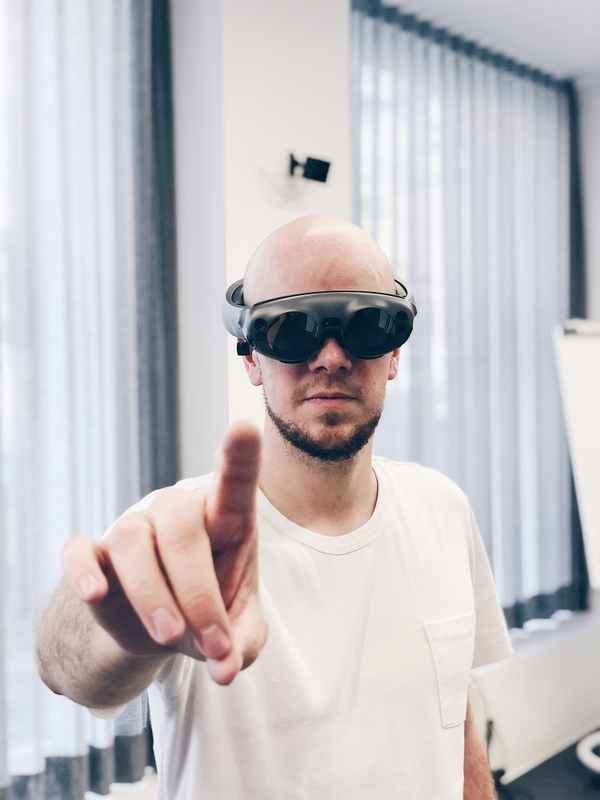 I am someone who develops interfaces and products for the digital world and is always driven by the desire for the best possible user experiences and relevant products. So, the various possibilities for implementing different gestures in this context are obviously of great interest to me. I am convinced that the usage of a product must be regarded as having a direct impact on branding. This means that our work should be focussed not only on user satisfaction, but also brand image. With details such as meaningful gesture control, offers are accepted much faster and can become much more immersive experiences much sooner. The gestures are often still very unnatural in practice. It can of course still be difficult to reach for a virtual stone, and high latencies leave you uncertain about whether you have grabbed it successfully or not. However, allowing developers to develop their own gestures enables testing and experimentation, ensuring faster development of user experiences and making the operation of extended realities as natural as possible. In conclusion, all in all the first version of the Magic Leap One offers a mega-experience and is an important step in the direction of consumer-facing AR for the living room. The hardware is rock solid, but Magic Leap still has some details to work on. The massive hype built up in recent years by the communications is the major factor negatively impacting on the overall impression. Because the Creator Edition cannot really fulfil this dream just yet. Just like with all modern platforms, they are now asking for the opinions of the third-party development community. 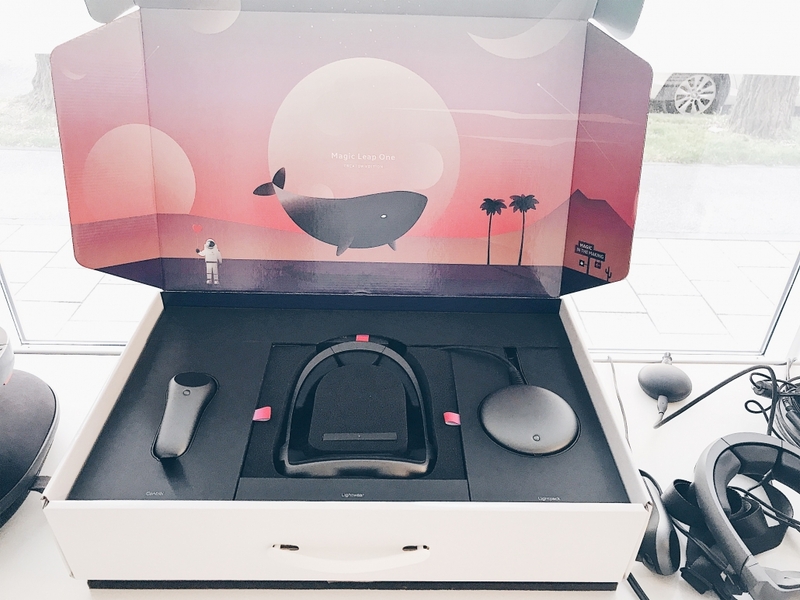 This will quickly reveal the actual potential of the platform and provide Magic Leap with good support for further development of hardware and software. And what does it cost? If you want to buy one of these coveted devices, you will have to get it from the USA, and it will cost you the equivalent of just under EUR 2,000. Not to mention the customs duty for bringing it back to Germany. Apple fans have been waiting for these keynotes for years. Years of anticipation, wondering if there will be a “one more thing”. And no, that was unfortunately (once again) not the case in the middle of September with the presentation of the Apple Watch 4 and the latest iPhone. We are currently seeing more evolutionary developments than this one innovation, which leaves us breathless. But on the other hand, most device visuals and features are already leaked before the events. So, no mega highlights? Everyone certainly has a different view of it. My personal highlight was primarily the following development: with the Apple Watch, Apple is increasingly developing into a health brand. The old saying “An Apple a day keeps the doctor away” gets a whole new meaning. While Apple is still a lifestyle brand, the true essence of the brand is to simplify or facilitate the customer’s daily business and life. And this pledge is now being taken to the next level with an infrastructure for sports and health-conscious people who can count on Apple even in a real emergency. Apple has installed new electrodes and heart rate monitors, so that ECGs can now be performed with the help of the Apple Watch. This is a true milestone and a tremendous benefit to cardiovascular patients. In the past, unwieldy equipment was essential for ECGs. But these can now be done by the watch, and, according to the company, reliably. And in order to remove any doubt, the US Food and Drug Administration certifies the professional functionality of the device. Not only does it make measurement easier in acute cases, this “Apple healthcare system” monitors the body’s own systems around the clock if required, raising the alarm long before the person can even detect signs such as atrial fibrillation. The detection rate is 97 per cent, according to one study. This could save human lives. In Europe, however, this function will not be available for the time being, and certainly some health and data protection committees have to give it their seal of approval. What if you have no cardiovascular problems, but are into extreme skiing, or have a tendency to fall? Then Apple has a function especially for you. In the event of a fall, an automatic alarm will be triggered unless you disable it within a minute. Then, readings and coordinates can also be transmitted to emergency services. And in the future, diabetic patients should even be able to use a blood glucose meter app with “One Drop” on their wrist devices. At least, that’s the promise. How is Apple managing to transition from a purely lifestyle brand into a health brand? While others are simply talking about a Quantify-Yourself movement, which will more likely appeal to nerds, Apple is pursuing a plan to become indispensable to Apple fans. Trust is fundamental for this. Trust that your most personal and intimate information is completely safe. And here too, Apple has (so far at least) proved itself beyond any doubt. Or, according to Fast Company’s headline after the last keynote: “Forget the new iPhones: Apple’s best product is now privacy”. And it’s not just since the last keynote that Apple has diverged from many other digital giants in this regard. In recent years, Apple has been excelling in how they deal with their – or rather, our – data. They have maintained absolute partitioning of all user personal data, and protected data against external access – even sometimes from personal inquiries by the FBI. This consistent concern for privacy has earned them a great deal of customer confidence. And this gives them probably the best foundation for getting involved in a mega-market of health products of the future. The 30 to 40-year-old fans of today will become the largest users of these offerings in the future. This is where Apple’s trustworthy data handling will become significant. Those fans will have been conditioned for years and will not be able to imagine living their lives without Apple products. Strategic calculation? No, Apple disciples would never accuse their beloved brand of this kind of scheming. But this far-sightedness would nevertheless be clever. In the series The inside story x 3, experts from the Plan.Net group regularly explain a current topic from the digital world from different perspectives. What does it mean for Granny, and for an agency colleague? And what does the customer – in other words, a company – get out of it? While you often find signs saying “No cash, only cards” in shops and restaurants abroad, cash is still the most popular payment method in Germany. In many places, debit and credit cards are not accepted. Up until now, mobile payment has also been difficult in Germany, but that could change this year. With the launch of Google Pay in June and the planned launch of Apple Pay in September, the German market will finally be tapped. So it’s high time for retailers and marketers to consider the impact of mobile payment on the shopping experience. Grandma, we have to talk. Why are you so determined to hold on to your beloved cash, and so reluctant to use new payment methods? Are you concerned about security? Fear of Internet fraudsters and concern about data protection is likely the major reason why mobile payment has not yet been successful in Germany. Mobile payment has previously been used for small, low-risk transactions, such as grocery shopping or public transport. Or are you reluctant because you do not yet realise how beneficial mobile payment could be for you? Admittedly, contactless payment using debit or credit cards at the register in bricks-and-mortar retailers has the same advantages as mobile payment: speed and convenience. Whatever the reasons preventing you from giving mobile payment a chance, you’re not alone. According to a survey by Oliver Wyman (2017), only seven per cent of German respondents have ever paid with their smartphone at the point of sale. The positive news: one third of non-users can imagine using mobile payment in the future. Here in Germany, we are still coming to terms with the “new” option of mobile payment, while in Asia paying by smartphone has long been part of everyday life. Last year, 70 per cent of mobile Internet users in China paid using their mobile phones (CNNIC 2017), which accounted for more than half of all payments in the same period, according to a study by the Deutsche Bundesbank. The leading providers are the instant messenger WeChat (WeChat Pay) and the online retailer Alibaba (Alipay). The use of these two mobile payment apps is simple. To complete a transaction, all you need is a QR code and the app. Simply scan the QR code and pay in the app. Alipay and WeChat Pay not only work in large stores, but can even be used to pay for a melon at a small street vendor. An even more exciting prospect is that, in the future, you may be able to pay without even needing your smartphone to authenticate the payment process. In the Chinese metropolis of Hangzhou, customers of the fast-food chain KFC can pay with a smile. The face recognition software “Smile to Pay” takes one to two seconds to create a 3D scan of the face and identify the customer. For security reasons, the order is additionally verified by entering the mobile phone number. Will developments in the mobile payment sector have an impact on agency work? Probably not any time soon. But in the future it may be possible to book the post-payment page as an advertising space with Google Pay and to play ads that are tailored to the user profile – age, gender, region and consumer behaviour. How can merchants take advantage of mobile payment for themselves? Mobile payment has so far been somewhat neglected by bricks-and-mortar retailers. Digital trends such as augmented reality, virtual reality and speech assistants have been seen as much more exciting. But mobile payment is an important part of the digitisation of bricks-and-mortar retail and should not be ignored. Many customers already use their smartphone during offline shopping – as a storefinder, for product research or for navigation within the store with the help of augmented reality apps. Now, the next logical step is the digitisation of the purchase. When bricks-and-mortar stores support mobile payment as a payment method, they offer their customers two advantages, namely time savings and convenience. With consumers’ increasingly fast-moving and mobile lifestyle in mind, these factors are critical to customer experience and customer satisfaction. The fashion department store Breuninger is a pioneer of mobile payment in Germany. Breuninger is the first German department store to offer Alipay and WeChat Pay as a payment method aimed at wealthy and shopping-happy Chinese tourists. Will German shoppers start using mobile payment methods more in future? Only time will tell. In any case, bricks-and-mortar stores should already be considering how to integrate mobile payment into the customer experience. Ever heard of Kuro Takhasomi? No? Better known by his nickname KuroKy, the 25-year-old from Berlin is one of the biggest stars in his sport, and has already played his way to over USD 3.7 million in prize money. In mid-August, KuroKy and his co-players from Team Liquid will be competing in “The International”, a major eSports tournament taking place in Vancouver. Their aim? To defend their title in the world’s most lucrative eSports event. The name of the event? Dota 2, a team-based computer game. Long derided as the antisocial hobby of cellar-dwelling teens, eSports are now well on their way to becoming a billion-dollar market – and the sponsorship and advertising opportunities in this rapidly-developing scene are enormous. If my Granny were to ask me what eSports are all about, the answer would be pretty straightforward. Just like in the Olympics, players compete with each other either individually or in teams in disciplines of all kinds. Instead of volleyball, tennis or archery, however, these disciplines are computer games, such as Dota 2, League of Legends or Counterstrike. The equipment? Rackets, trainers, and balls are replaced here by a mouse and a keyboard. And the different games are just as varied as traditional sporting disciplines – there’s no single “eSport”. The various games are organized into leagues and championships in which the competing teams often hail from all over the world. The final rounds of these fill massive arenas with thousands of spectators, with the events also broadcast on the Internet and, increasingly, on traditional television. There is one thing that sports and eSports do have in common, though: the leap from hobby to career can only be made with years of hard training and huge amounts of discipline. And it’s here that the answer can be found to that often-asked question, “Why would people want to watch other people playing games?” For the same reason that people sit in front of their TVs watching the likes of Lionel Messi, LeBron James or Serena Williams do their thing: because they’re the very best in their respective disciplines, and can perform feats that the hobby player can only dream of. eSports are primarily a digital entertainment medium, with high coverage and long viewing times that make them perfectly suited to digital display and video advertising. The primary target group consists of young, tech-savvy men, who are nowadays often difficult to reach using traditional media. The most important eSports platform is undoubtedly Amazon´s subsidiary Twitch, where eSports count among the most watched content. A special feature of eSports is the close link between the pros and the fan community: many eSports enthusiasts not only follow the big tournaments, but are also loyal viewers of daily player training sessions, during which they are able to interact directly with the stars they emulate and learn more about their favourite games. Recent years have also seen YouTube and Facebook begin investing heavily in eSports. At the beginning of the year, the Electronic Sports League signed an exclusive streaming deal with Facebook for some of its popular tournament series, including Counterstrike. For companies, eSports represent an extremely attractive sponsorship environment. This is because it is precisely those target groups who would otherwise be unlikely to be especially open to sponsorship and advertising communication who are really interested in seeing “their” game and “their” heroes flourish. The multiplier effect of sponsoring eSports teams or players shouldn’t be underestimated either. The continuous presence of gamers on streaming platforms both between and during tournaments serves to make sponsors an integral part of the community; after all, it is the sponsors who make it possible for the athletes to turn their hobby into a career and to compete at a high level without financial concerns. The fans appreciate this, which makes it easy for brands to cultivate a positive perception of themselves within the scene. In combination with a social media team that engages to some extent with gaming culture and interacts with fans on an equal footing, as well as minor campaigns such as give-aways, this can result in a powerful marketing tool. A recently published study by our colleagues from WaveMaker has shown that, in addition to high awareness, brands with a presence in the eSports environment – primarily those from the drinks and technology sectors – have also achieved very high brand activation among eSports fans. And another thing: A good opportunity to gather some first impressions of eSports, gaming, and its fans will be provided at the end of August by GamesCom in Cologne. At last, summer is here. But artificial intelligence doesn’t take summer off, so it can be the ideal babysitter in the car, especially when stuck in a traffic jam. That is, as long as the language assistant actually has something to say. That’s what our SEO News for the month of August is all about. And of course, we can’t avoid the notorious silly-season monster. Dialogue with machines is still a hot topic. Last month, we reported to the workforce on Google Assistant’s automated voice commands. Now, Mountain View is substantially simplifying the world of voice assistants, which is ideal for those content publishers who are trying to get started in this area. “Speakable” is Google’s first semantic markup that identifies text clips for voice output. The company states that the markups were provided through the industry initiative “Schema.org” and are still in the beta phase. With “Speakable”, news publishers and other content providers can mark up short, text-optimised sections within an article or webpage, so they can be used directly by the Google Assistant. Google advises that the text should be a maximum of two to three sentences long, similar to a teaser. This way, the assistant’s speech output has a talk time of 20 to 30 seconds. For optimal use, the content of the text should present the topic informatively and in short sentences. Google also suggested that headlines should be used. Content selection must ensure that technical information, such as captions, dates or source references, does not interfere with the user experience. In the age of artificial intelligence, the optimised use of markups is becoming increasingly important for search engine optimisers, especially as the number of delivery platforms is also increasing. The standardisation of supplemental information in the source text enables all systems involved in selecting and displaying the search results to reliably collect and optimally process the data. The “Speakable” feature will initially only be available for the English language in the US market. However, Google has stated that it plans to launch in other markets, under the condition that “a sufficient number of publishers implement Speakable”. So the SEO industry will certainly have its work cut out. When it comes to the future of digital searches, the focus is slowly shifting from analysing requests and intentions to reflecting on answers and output systems. The key challenge for successful human-machine communication, alternating between interactive displays, augmented reality and voice assistants, will be to provide the best possible result for each channel. Is there one answer, multiple answers or does the initial question then lead to a conversation between the search system and the searcher? In principle, the process is the same with a virtual assistant as it would be with a physical advisor: Do you want a quick result or a full sales pitch? Do you want to be left alone to browse quietly or do you need the help of a sales assistant? Is a brief answer enough or do you want to break down your query into more specific stages until you get the right result? The American company “Yext” has now introduced a collaboration with Amazon, which enables the import of NAP data (name, address and telephone number), as well as allowing the language assistant Alexa to import opening hours directly from local companies. The New York-based company told journalists that they plan to further integrate their interface with Amazon Alexa in the future. Product data and catalogues may be included at a later stage, but this has yet to be decided. The automation of the data exchange between the owners of digital offers and search systems is already a key component of success in modern digital retail. The goal of this is to create an optimal user experience at the point of issue, as well as valid measures of success. Providing and optimising data feeds is key for optimal functionality of Google’s PLA (Product Listing Ads) or the use of price search engines and affiliate networks. In the world of Amazon, the necessary interfaces and tools are only gradually being created. And when it comes to profiting from the growth of digital voice assistants, that’s exactly where the greatest potential currently lies. Do you still remember Lotti the snapping turtle, Yvonne the elusive cow, or Sammy the caiman? Fortunately, there are search engines that give us the opportunity to relive the stories of these adventurous, silly-season animals. And even years later, we are still captivated by them during the summer-holiday slump. In this latest ‘animal’ news sensation, it was a virtual rabbit that brought the world’s largest search engine Google to its knees. The story was published under the headline “Rabbit Bug” by the Spanish programming collective “La SEOMafia”. According to their information, a table was inserted into the source code of a website in order to deliberately manipulate Google’s SERPs. The bug was based on the fact that Google cannot interpret this formatting when displaying the search result, leading to the sudden termination of the search result display after the manipulated entry. This bug was implemented on a top-ranking site for the keyword “conejos” (Spanish for rabbits), with the result that only one, manipulated, search hit was displayed. It is easy to imagine the incredible click rates that could be achieved by using this strategy. It’s always a pleasure to see some creative spirits shake things up in the now mature and grown-up world of the SEO industry. Eventually, even Google’s SEO liaison officer John Müller became aware of the Rabbit Bug and reported on Twitter with a wink that he had circulated the sighting of the rabbit in-house. The rabbit is now threatened with the fate of all silly-season animals. In the end, most were captured or killed. You have created award-worthy advertising and invested heavily in media – and then your customer gets stuck on an incompetent hotline for over half an hour. You have sent out a perfectly personalised e-mail newsletter – but unfortunately your customer is redirected to a general category page of your online shop when they click on it. You start a limited sales promotion, but even weeks after it’s ended the retargeting banners follow your users everywhere. Marketing is a bit like dating: sometimes it’s the small things that can ruin a good first impression. When customers gain experience with brands or products today, they do so in many places: in store, online, via social media, on the phone and on the street. In the best case, this customer experience results in a coherent overall picture. But in reality this is often not the case. Why? Because companies have structures that can often make it difficult for the focus to lie on the customer experience as a central element of their actions. And this is despite more and more companies being aware of how important this aspect is. In times of increasing price transparency and decreasing brand loyalty, a coherent customer experience is an important differentiating feature. If you can’t find AND retain your customers, you’re in trouble. For brands this means concentrating on giving the customer reasons to become and remain a customer. And because the platform economy of the digital world is making (price) comparisons easier and lowering exchange hurdles, it often no longer comes down to ONE reason – a great product, an unbeatable price, a good brand image people like to show off and so on. The key to success and sustainability in the digital age is a coherent and above all relevant customer experience. A further challenge is that digitalisation affects many, if not almost all, areas of a company, from product development to management, marketing and services. If companies really want to put the customer at the centre of their activities, they have to tackle this task across departments. This means breaking down the barriers between areas and/or promoting a different form of cooperation within the company. Admittedly, this is a complex and far from easy task. Let’s take marketing and communication as an example: traditional advertising, digital marketing, CRM or dialogue marketing, PR/corporate communication and social media often exist side by side in historically separate silos. Relevance is a decisive factor in determining customer experience. Relevance is determined by the customer’s subjective experience. Does the customer like the advertising? Was the person on the hotline friendly? Did the customer find what they were looking for on the website quickly? Every customer makes their own judgement. If you summarise the evaluation criteria, they can be divided into two general categories: First is utility and second, usability. Utility describes how valuable the experience and the received content were for the user. How well does my experience correspond to my particular requirements? Does the content answer my questions? Does it solve my problems? Does it meet my expectations or even surpass them? Usability is an overarching term for the user-friendliness of customer experiences. It’s not about the content, but about how easy it is to use, control and operate products or services. And of course the experiences at the different touch points must also result in a suitable overall picture and has to be very well networked. Experience from many projects shows that utility and usability only form a coherent picture if companies enable their different experts inside and outside the company to work together on a relevant customer experience. In a digitalised world of brands, people expect meaningful personalised content. Every year a company like Lufthansa, for example, sends out 500 million newsletters to different target groups, in different locations, featuring a wide variety of services. The keyword “personalisation” encompasses an extremely complex and elaborate communication architecture designed to ensure a coherent digital user journey, starting from the user’s inspiration to fly long before take-off, all the way to when they land back at home. Plan.Net built its own newsletter cockpit for the airline for the sole purpose of personalising their newsletter. A shared platform for Lufthansa Marketing and its service providers with an intuitive interface, a modular system for content and a real-time preview. Dialogue communication via e-mail is also synchronised across the board with banners, apps and social media platforms. This is just one example of a project that could be realised with cross-departmental work coordinated between the brand and the service provider. Audible, the subsidiary wholly-owned by Amazon, takes a different approach. The market leader in the digital distribution of audiobooks follows a 360-degree approach that combines communication, media, research and tracking. A wide variety of content is prepared and controlled via media placements in order to address the users in the right way – depending on their interests and needs, as well as what stage of the user journey they are at. The cost-per-lead can be significantly reduced by using content marketing tailored to the user experience like this. This may sound banal, but in many companies the available data and information is not evaluated as comprehensively as it could be, nor used across departments to the extent that could be possible. It is not only social media that gives you the opportunity to learn what people think about you and what their needs are. Take advantage of these opportunities and always think from the user’s perspective when creating your products and services. Where do I reach my customers? Which media and non-media points of contact do my customers use in which phase of their relationship and what are their intentions? What added value can help me to be more customer-centric? Product enhancements, services – there are many ways to expand a service in a customer-centric way. Use solutions from partners as needed – you don’t have to reinvent the wheel every time. How can I personalise my offers? Communication, websites, services and products – almost everything can be personalised nowadays. Use this opportunity to create the highest possible relevance. If you have answered these questions honestly and comprehensively, you will have created a very good basis for the best possible success today, and for the sustainability of your marketing tomorrow. Summer is finally here and the nights are long, which gives us plenty of time to think about the fundamental questions of life. That’s why the July issue of SEO News examines not just the forthcoming Google updates, but also the cognition game show and the future pecking order on our planet. Once again, Google is focusing on the convenience and security of Internet users. The company (which in its own words aims to do no evil) is launching not one, but two updates in July – whose effects will be of equal benefit to Internet users and website operators alike. Both of these changes were announced a long time ago and have already been partially implemented. The first change will see the loading speed of mobile websites become an official ranking factor. Loading speed is already listed as a quality criterion in Google’s top 10 basic rules for website quality; however, it has taken a very long time for it to become a genuine ranking factor. The change was originally introduced based on studies showing that slow-loading websites experienced direct impacts on their clickthrough and conversion rates, and the speed argument was also repeated like a mantra by Google representatives at various search conferences during the 2018 season. The subsequent introduction of the Mobile First Index (see our report here) means that the rule has now been made official for mobile sites too. Google recommends that website operators analyse their domains using Google’s own “Page Speed Report” and “Lighthouse” tools and make the necessary changes for mobile websites. Alongside its speed update, Google is also getting serious in July with its announcement that websites which are not converted to the encrypted HTTPS protocol before the deadline will be marked as “not secure” on Chrome. This change also marks the end point of a campaign that was launched over two years ago in 2016, when Google began its awareness-raising work with a small ranking boost for secure websites. Google has described that measure as a success, with the company stating that around 68 per cent of all Chrome traffic on Android and Windows now occurs over HTTPS – and there is plenty of scope for that percentage to grow. The fact that Google is leveraging its market power to implement technical standards with the aim of improving the user experience is a step in the right direction. Many companies were only prepared to invest in faster technology or secure licences when threatened with reductions in traffic or sales. In order to prepare for future developments, it is advisable to keep an eye on new technologies such as AMP (Accelerated Mobile Pages), mobile checkout processes, and pre-rendering frameworks that allow content to be pre-loaded. These innovations can help you keep pace, especially when it comes to improving user perceptions of loading rates on all platforms. This bit will be tricky for those of you who didn’t pay attention in maths. Remember that moment back at school, somewhere between integral calculus and stochastic processes, when you belatedly realised that you’d completely lost the plot? Well, in the age of algorithms that will come back to haunt you – especially if you work in online marketing. In everyday terms, an algorithm is nothing more than a carefully ordered chain of decisions designed to solve a problem in a structured way. The crucial innovation in recent years is the advent of artificial intelligence and machine learning. Nowadays, the individual links in the algorithmic chain are no longer assembled by people, but by programs. When you ask a search engine a question, the information is taken in, its core information object (the entity) and intention are identified by means of semantic analysis, and the most empirically appropriate result (the ranking) is returned in the correct context (e.g. local and mobile). However, a group of seven Google engineers presented a research project at the ICLR Conference in Vancouver that turns the question/answer principle on its head. For their project, the researchers used tasks taken from the popular US game show “Jeopardy”. On this show (first aired in 1964), contestants are required to provide the right questions in response to complex answers. In their study, the Google engineers exploited the fact that Jeopardy tasks involve information deficits and uncertainties that can only be resolved by formulating the right question. In other words, the question needs to be adapted until the information provided in the answer makes sense in its specific combination and context. The human brain performs this task in a matter of seconds, and is able to draw upon a comprehensive range of intellectual and social resources as it does so. However, if you ask a Jeopardy question (such as “Like the Bible, this Islamic scripture was banned in the Soviet Union between 1926 and 1956”) to a search engine, you will not receive an appropriate answer. Google returns a Wikipedia article about the Soviet Union, meaning that it interprets this search term as an entity or a core information object, and thus falls short. Microsoft’s search engine Bing comes a little closer to the obvious answer from a human perspective (“What is the Koran?”), but is likewise unable to deliver a satisfactory result. This little trick involving Jeopardy questions makes clear what the biggest problem is for search engines (even though it is marketed as one of the main markers of quality for modern search systems): how to accurately recognise the intention behind each search query. The idea is that what SEO professionals in companies and agencies currently work hard to develop should be reliably automated by the search engines themselves. In order to achieve this, the Google researchers developed a machine-learning system that reformulates possible answers to the Jeopardy question into many different versions before passing these on to the core algorithm itself. In step two, the answers obtained are then aggregated and reconciled with the initial questions. The results are only presented to the user once these two intermediate steps are complete. The self-learning algorithm then receives feedback on whether its answer was right or wrong. The AI system was subsequently trained using this method and with the help of a large data set. As a result of this training, the system learned how to independently GENERATE complex questions in response to familiar answers. This milestone goes far beyond simply UNDERSTANDING search queries, which are growing increasingly complex under the influence of voice and visual search. Although this study was carried out by Google, we can assume that Microsoft, Yandex and Baidu are also working on equivalent technologies designed to further automate the recognition of search terms and to automatically generate complex, personalised content in the not-too-distant future. At present, however, it is impossible to gauge what effects this might have on the diversity and transparency of the Internet. While we’re on the subject of automatic content generation, we also have an update on Google’s uncanny presentation of two phone calls between the Google Assistant and the working population. Back in May, the search engine giant from Mountain View presented a video at its “IO” developer conference in which an AI extension to the Google Assistant named “Duplex” booked an appointment at a hairdresser’s and a table in a restaurant entirely on its own, all while perfectly imitating human speech. The human participants in those conversations were apparently unable to recognise that they were interacting with a machine while they went about their work. Close collaboration with robots and AI systems has long been familiar to industrial workers in the Western world, but now this development is also moving into the service economy, and therefore into our day-to-day lives. At first glance, the Google scenario was astonishing and convincing; however, the unnerving initial impression was swiftly followed by a number of pressing questions. In particular, the fact that Duplex failed to identify itself as a machine to its human conversation partners was the subject of considerable debate. Google has since responded and published a new video in which the Google Assistant identifies itself at the start of the conversation and states that the call will be recorded for quality control purposes – similar to a recorded message in a call centre. Taking a more detached view, however, one wonders whether this responsiveness on the part of the artificial intelligence is actually completely superfluous. The restaurant employee in the video follows the Google Assistant’s instructions obediently, as if he is talking to a human being – there is no difference whatsoever. In search marketing, we attempt to further our own interests by reflecting the intentions of target groups and consumers in the content produced by search engines (the results pages). In voice search, we issue commands to a machine – and a number of years will pass before we learn how that will change us. And in Google’s future scenario of an invisible, omnipresent and convenient system that allows users to organise themselves and solve problems, the human simultaneously becomes both the subject and the object of the technology. Our data was used to create, feed and train the system, and so we may briefly feel ourselves to be its masters; however, given the current state of affairs, we can and should seriously question whether we will recognise the point of no return once the balance finally tips.